What if grudges are not just good for us but great? 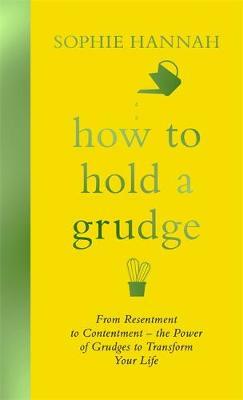 How often have you held a grudge and felt guilty about it? 'Forgive and move on' is the received wisdom, and that's what many of us try to do. Positive thinking is essential for a happy life, but how we get to that positive is even more crucial. What if grudges can ward off danger, and help us live better lives? What if they can act as stepping stones, pointing us in the right direction? This ultimate guide will give you all the tools you need to analyse, process and embrace your grudges in order to be your best possible self. Sophie Hannah is an internationally bestselling crime fiction writer. Her crime novels have been translated into 34 languages and published in 51 countries. Her psychological thriller The Carrier won the Specsavers National Book Award for Crime Thriller of the Year in 2013. In 2014 and 2016, Sophie has written the first new Hercule Poirot mysteries since Agatha Christie's death, which have been national and international bestsellers. Sophie's thrillers The Point of Rescue and The Other Half Lives have been adapted for television as Case Sensitive, starring Olivia Williams and Darren Boyd. Sophie is also a bestselling poet who has been shortlisted for the TS Eliot award. Her poetry is studied at GCSE and A-level throughout the UK. Sophie is an Honorary Fellow of Lucy Cavendish College, Cambridge. She lives in Cambridge with her husband, two children and dog.